If your school is located in Bromley, we can provide Scratch inset training for teachers, a games design after school club, and equipment and infra-structure advice. We deliver after school games design clubs at primary schools in Bromley. 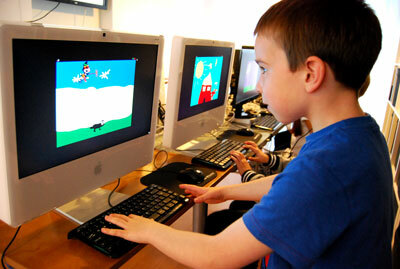 Our KS1 and KS2 clubs support and complement the new computing curriculum. We will help you give your learners a head start in gaining essential skills and knowledge which will help them achive learning tragets and prepare them for educational progression and future careers. Our activities not only teach essential underlying technical knowledge and skills such as computational thinking, file management, GUI tools, keyboard short-cuts, programming and math, but also utilise images, sound, animation and interactivity to inspire and motivate children. If you like, we can come to your school and run a free taster session for a group of learners. Staff and children will have an opportunity to experience what we do and see how a game is created. We know how challenging it can be for teachers to learn unfamiliar subjects and technologies and develop strategies to teach them. We can help by delivering inset training which will improve the knowledge and confidence of teachers, and show them how to create effective lesson plans and devise activities and projects. We offer half day workshop inset training sessions with 12 months access to our supporting example games, tutorials and exercises to help teachers to .. Call us on 07546 905 718 or contact us by email. We have extensive knowledge and experience of the pros and cons of deploying desktop, laptop and tablet systems in schools. In consultation with your IT support staff, we can ensure that the right decisions are made, appropriate free or low cost software is installed, support and maintenance costs are minimised and security and safeguarding is assured. Call us on 07546 905 718 or contact us by email to arrange a time for us to visit you and discuss your needs.